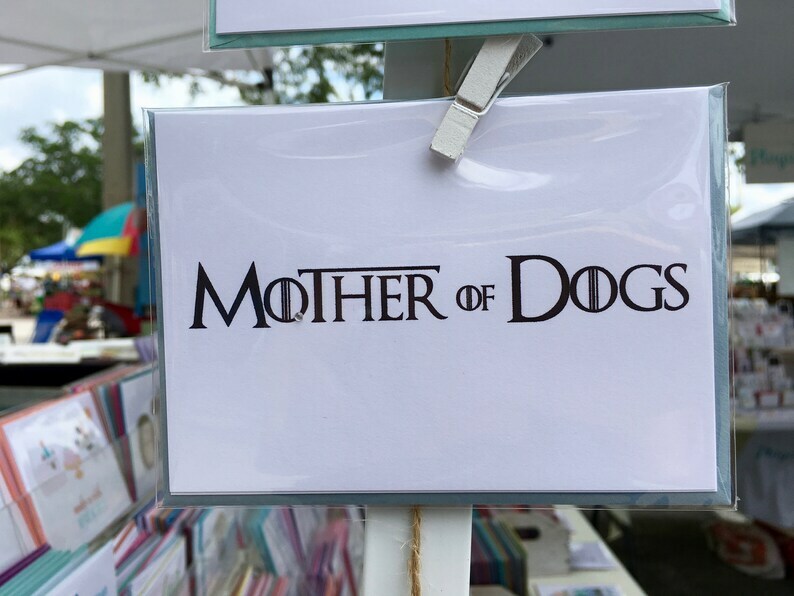 This dog greeting card is the perfect Mother's Day card for a Game of Thrones fan! This card can be fully customized and personalized at no extra charge and also includes a free matching colored envelope, round envelope seal, and a U.S. Forever postage stamp. On the front of the card, there is the message, "Mother of Dogs," which is a play on the Game of Thrones character, Daenerys Targaryen, from the House of Targaryen, who is the Mother of Dragons. The card measures 4.875” x 3.5” (A1 notecard size) when folded and is blank on the inside. If you prefer a larger greeting card size, please select 5.5" x 4.25" (A2 size) from the card size options.